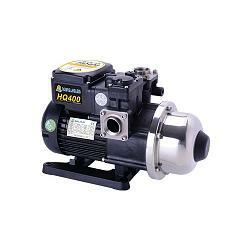 This is the Walrus 1/2 HP electric pump. The HQ series pumps are designed for water supply and pressure boosting in residential, commercial and light industrial applications where low or inadequate water pressure exists. It is suitable for boosting pressure from underground or surface water supplies. Potable water or other clean or non-corrosive liquids. 1. The HQ is a complete, all-in-one unit, consisting of pump, motor, pressure tank, and electronic controller. The built-in electronic controller ensures that the pump starts automatically when water is consumed and operates continuously until water is not required. It will also protect the pump when it is in faulty conditions. 2. Compact design and quiet operation make the HQ series suitable for many applications. 3. Impellers are constructed of stainless steel for greater durability. 4. The built-in indicator lights on top panel will display the pump's working condition and diagnosis. - HQ800 with standard head is ideal for boosting city water so that PRV is no more required. - HQ800H with higher head is ideal for tank system that require higher boost pressure. 7. Offer the new designed cast aluminum motor for higher efficiency and lower amperage draw. Products manufactured by Walrus Pumps Co (Walrus) are warranted to the first user only to be free of defects in material and workmanship for a period of 12 months from date of installation, but no more than 24 months from date of shipment. Walrus' liability under this warranty shall be limited to repairing or replacing at our election, without charge, FOB Walrus' distribution center or authorized service agent. Walrus will not be liable for any cost of removal, installation, transportation or any other charges that may arise in connection with warranty claim. The warranty period commences on the date of original purchase of the equipment. Proof of purchase and installation date, failure date, and supporting installation data must be provided when claiming repairs under warranty. This warranty is subject to due compliance by the original purchaser with all directions and conditions set out in the installation and operating instructions. Failure to comply with these instructions, damage or breakdown caused by fair wear and tear, negligence, misuse, incorrect installation, inappropriate chemicals or additives in the water, inadequate protection against freezing, rain or other adverse weather conditions, corrosive or abrasive water, lightning or high voltage spikes or through unauthorized persons attempting repairs are not covered under warranty. Walrus will not be liable for any incidental or consequential damages, losses, or expenses, arising from installation, use, or any other causes. There are no express or implied warranties, including merchantability or fitness for a particular purpose, which extend beyond those warranties described or referred to above. Certain states do not permit the exclusion or limitation of incidental or consequential damages or the placing of limitations on the duration of an implied warranty, therefore, the limitations or exclusions herein may not apply. This warranty sets forth specific legal rights and obligations, however, additional rights may exist, which may vary from state to state.